SUPBAR SHOTS. China has a drug problem. 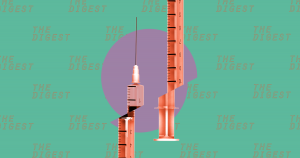 No, not the kind that requires a stint in rehab — the nation is in the midst of a scandal involving drug makers selling hundreds of thousands of unsafe vaccines, endangering the lives of Chinese citizens. And the government is ready to bring those responsible to justice. DOUBLE TROUBLE. On July 15, the State Drug Administration (SDA), the agency responsible for regulating China’s healthcare industry, announced that vaccine maker Changsheng Bio-Tech had forged data for roughly 113,000 doses of its human rabies vaccine. The SDA discovered the forged data during a surprise inspection of Changsheng’s facilities. Via a statement, the SDA announced that it had ordered Changsheng to halt production of the vaccine. There have been no reports of anyone harmed by the vaccine so far. Five days after they discovered the botched data for the rabies vaccine, drug inspectors in China’s Jilin province reported that Changsheng had also sold 252,600 substandard DPT (diphtheria, whooping cough, and tetanus) vaccines to Chinese disease control and prevention centers. Infants receive that vaccine as part of a compulsory government program, and no one is quite sure how many doses officials have administered nor what impact those doses might have on children that received them. There are no reports of anyone falling ill yet. THE HIGHEST OFFICE. Amid the public outcry over these unsafe vaccines, the Chinese government is now launching an investigation into the company. “The violations by Changchun Changsheng Bio-technology are serious and appalling,” said President Xi Jinping, according to state broadcaster CCTV as reported by The South China Morning Post (SCMP). So far, police in Changchun have taken the the firm’s chairwoman, Gao Junfang, and four senior executives, into custody for questioning, and the company is already facing a fine of ¥3.4 million (US$510,000) for the DPT vaccines. THE LOWEST CONFIDENCE. Chinese citizens are understandably upset by the situation. “I [and my family] will not be having any more vaccinations on the mainland until the government takes real and serious steps to resolve this issue,” one father told SCMP. Vaccines have saved countless lives, but they only work if a large enough portion of a population gets them. If the Chinese government isn’t able to restore citizens’ confidence in vaccines, it could find itself facing a public health crisis. Fake drugs are a growing global problem, so the Chinese government would be smart to show that it won’t tolerate that from companies within its borders. People elsewhere should hope so, too — China produces a huge number of drugs that are shipped to nations all over the world.